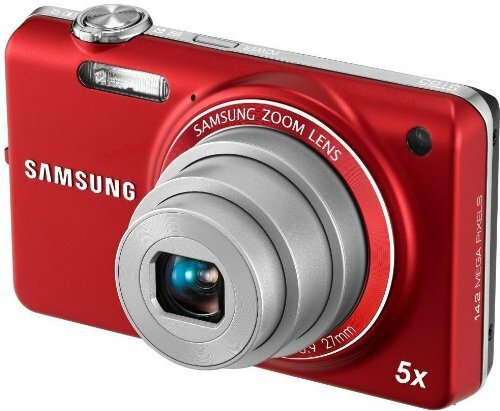 Samsung ST65 Digital Camera makes it easy and fun to shoot high quality pictures and HD video, and it's so small you'll never have to leave it behind. This attractive, tiny (3.6 x 2.2 x 0.8"/9.1 x 5.5 x 2 cm) camera packs a 14.2MP resolution punch for capturing every detail. The 5x wide-angle 27-135mm optical zoom lens is perfect for wide group shots of all your friends, plus parties, landscapes, portraits, or even sports and wildlife photos using the 135mm telephoto setting. And it's even more exciting when shooting high definition (HD) 1280 x 720p video with sound. To get rid of any shaky photos or video, digital image stabilization is built-in. Looking at your pictures and videos is a treat on the bright 2.7" LCD screen. When you want to get creative, the ST65 is fully loaded with options that make your pictures magic: there are 15 photo modes, including Smart Filter features like a fisheye effect, a miniaturization effect, vignetting, and more. You can select color effects like Vivid, Forest, Calm or Retro, or settings for specific scenes like Action Fireworks, Sunset, Night Portrait or Backlight Portrait. The Perfect Portrait System, Beauty Shot/Self-Portrait, and Face/Smile/Blink Detection technologies make all of your photos of friends, family and other people gorgeous. And when you just want to point and shoot without worrying about settings, Smart Auto 2.0 takes care of everything--just press the shutter button for great photos every time.